Jack O'Connor is just one of our many hardworking Direct Support Professionals who deserve a fair wage. 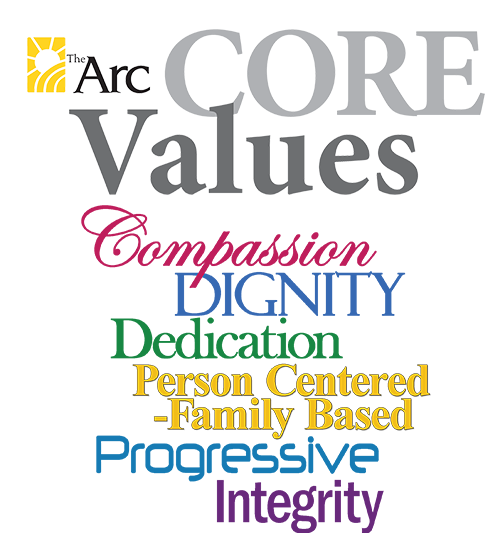 People who work at The Arc are invested in the mission but they have to be able to support themselves and their family. Contact your local representatives and tell them that people who provide the most critical support deserve to be compensated for it. Arc employee, Tammi Birchenough, speaks about working with people with disabilities in a workshop setting and how important it is for people to have a choice on wether or not they want to stay in that type of setting or transition into competitive employment in the community. The Arc held its annual Caregiver Retreat for parents and families of people receiving services through the Community and Family Services department. Keynote speaker, Kathy O'Connell delivered a powerful message about perseverance and capabilities of people with developmental disabilites. For more information, please visit www.thearcolc.org. The Fine Arc program is a Day Habilitation service offered at The Arc, Oneida-Lewis Chapter. People we support showcase their artistic skills in a variety of ways. This event was held at The Players Theatre in Utica. The Utica Fire Department assembled a team to play against The Arc, Oneida-Lewis Chapter. People we support with developmental disabilities had a dream of playing in a competitive basketball game in front of fans. Thanks to the UFD, their dreams came true. We had a great time, can't wait to do it again next year.